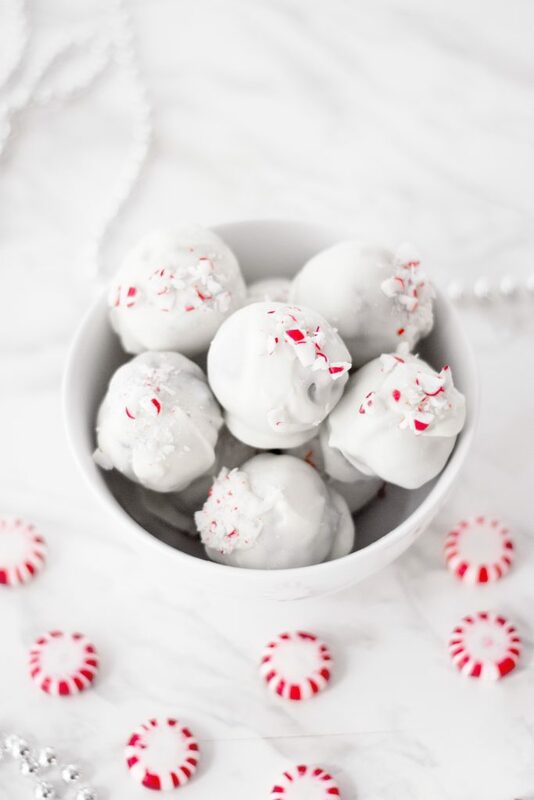 Today on the blog I’m sharing a super easy recipe for Peppermint Oreo Truffles. While baking is one of my absolute favourite things to do, when the recipes are no-bake my heart skips a beat! I am the resident baker for our family holiday parties, so having recipes that are quick and easy allow me to get more done quicker. And when it comes to pleasing a crowd, I know having a wide variety of desserts so there is something for everyone is key. 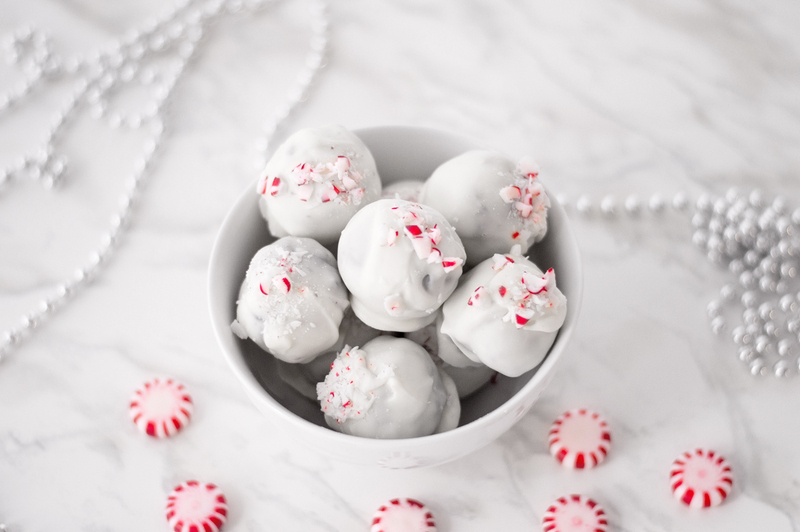 These incredible and super easy Peppermint Oreo Truffles are an amazing addition to any holiday dessert table. Make sure to put them on your baking list this holiday season! Place all of your Oreo cookies in a freezer bag and crush them to fine bits with a rolling pin. You can also use a food processor as an alternate method. 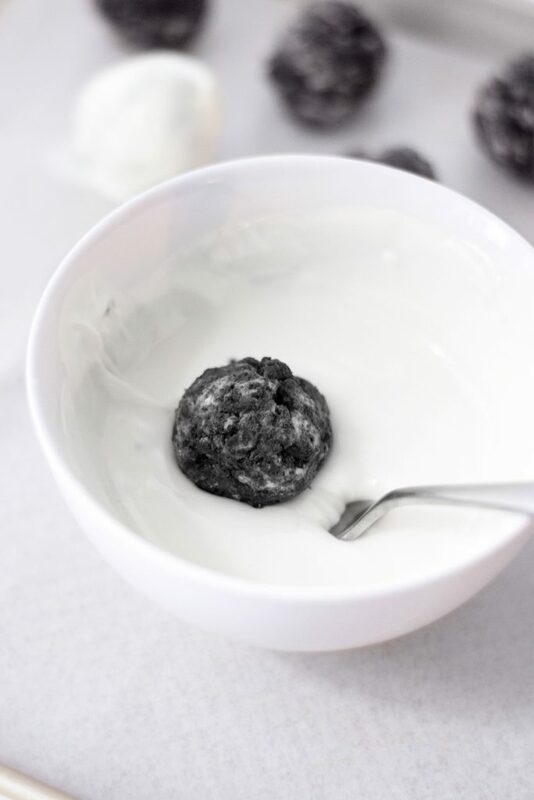 Pour the Oreo bits in a bowl, add the softened cream cheese and mix thoroughly. 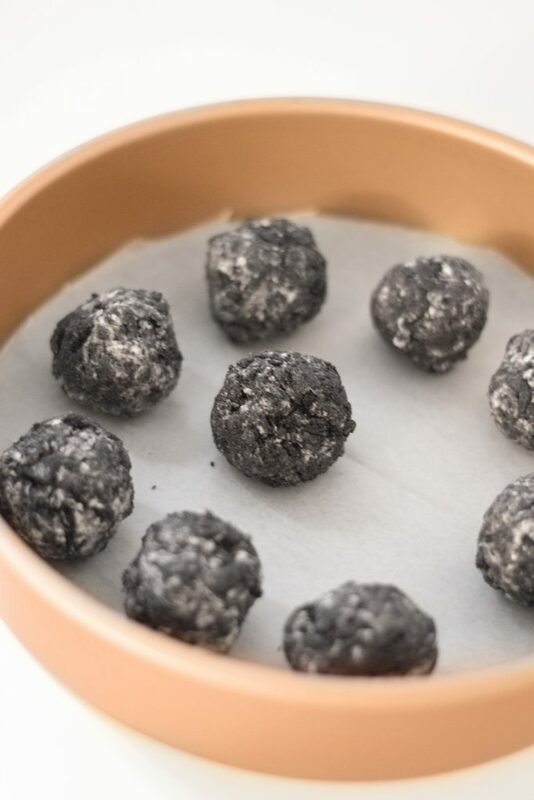 Roll your Oreo mixture into 1.5 inch balls and gently place on the lined pan. Refrigerate them for about one hour. 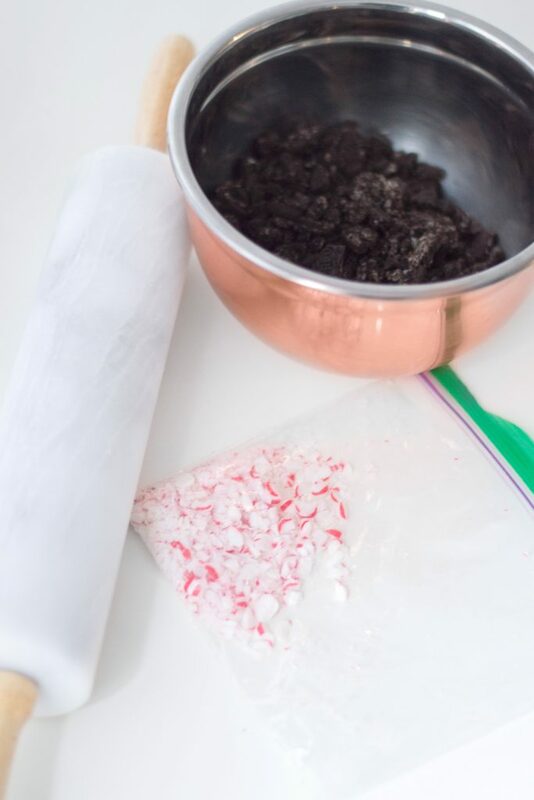 Place the peppermint candies in a sandwich bag and crush them with a rolling pin. Remove your balls from the refrigerator and set aside. Line a larger baking sheet with wax paper. In a small microwavable bowl, microwave white candy melts and coconut oil in 30-second intervals until completely melted. Using a fork, dip each Oreo truffle into the melted candy and coat completely. Place back on a lined baking sheet, sprinkle with peppermint candy bits and then refrigerate for another hour. 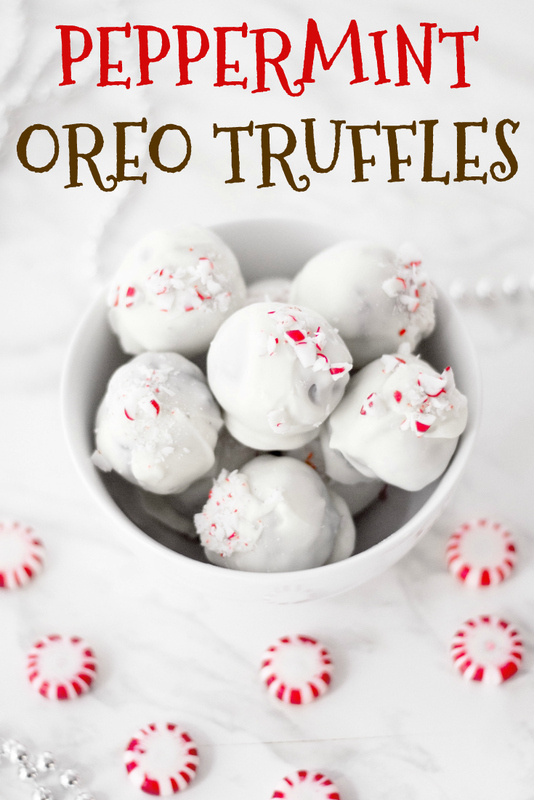 Just before your party place your Peppermint Oreo Truffles in a dish and enjoy! Place all of your Oreo cookies in a freezer bag and crush them to fine bits with a rolling pin. You can also use a food processor as an alternate method. Pour the Oreo bits in a bowl and add the softened cream cheese. Mix thoroughly. Line a pan with wax paper. Roll your Oreo mixture into 1.5 inch balls and gently place on the lined pan. Refrigerate for about one hour. Place peppermint candies in a sandwich bag and crush with a rolling pin until you achieve fine candy bits. Remove from the refrigerator and set aside. Line a larger baking sheet with wax paper. In a small, microwavable ball, microwave white candy melts and coconut oil in 30-second intervals until completely melted. 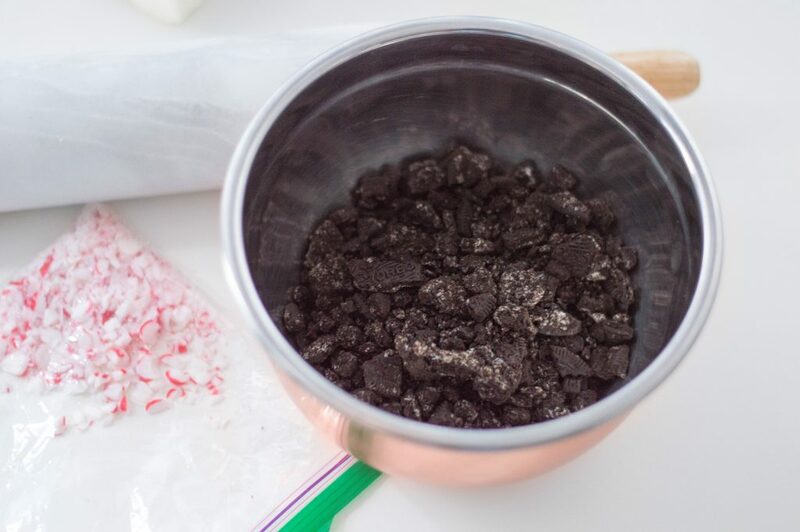 Using a fork, dip each Oreo truffle into the melted candy and coat completely. Place back on lined baking sheet. Sprinkle with peppermint candy bits and refrigerate for another hour. Don’t forget to check out our Holiday Recipe section for more delicious treats! so easy to make! will have to add the recipe to my Christmas cookie list! 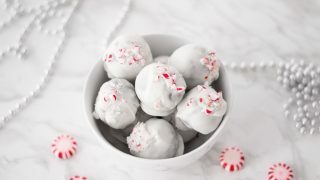 I love anything peppermint flavoured and they looked easy to make which suits me too! Going to try these tonight with the kids! Love white chocolate and peppermint around the holidays!